USA National Miss Wisconsin is a natural pageant for young ladies ages 4-25 and is the official preliminary to USA National Miss Scholarship Organization (UNM). Our program combines all the beauty and excitement of pageantry with the glamour and energy of a runway fashion show – while recognizing the personal achievement, community involvement and academic excellence of young women all across the great state of Wisconsin! Keeping with the tradition of pageantry, our system encourages young women to be graceful, articulate, accomplished females with strong values and self worth. 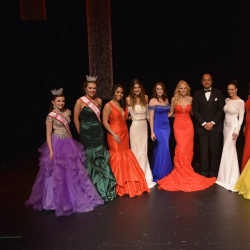 UNM presents a positive approach to pageantry – no swimsuit competition, no experience necessary, no mandatory talent and no make-up in our younger divisions. We strive to develop leadership, public speaking and communication skills while building self-confidence among the nation’s young women. USA National Miss Wisconsin already has a jam packed, fun-filled pageant weekend from orientation to a check-in party, to rehearsals, appearances at a local non-profit partner, competitions, tours through the famous Green Bay Packer Stadium, and a beautiful final show for all to enjoy! Come join us and start making friendships, skills, and memories to last you a lifetime! But don't wait, register TODAY! Registration closes December 31, 2015! Mention you found our pageant via Pageant Planet and SAVE the one time $50.00 application fee! State registration is then only $295.00 and our state prize package is valued over $100,000.00 including FULL RIDE COLLEGE Scholarships being awarded! CALL: 1-844-STRONGU (787-6648) to get started today!